As a marketer, you may not exactly be what some agencies refer to as a ‘unicorn’, and you shouldn’t strive to be. Why? Because you don’t need to fit the description of a mythical creative in order to be successful in your career. media update’s Jenna Cook journeys into the magical world of marketing to find out if unicorns really are as cool as they’re said to be (and if they even exist). You may think that in order to make a name for yourself in marketing, you need know a little bit about everything the industry has to offer. But being a unicorn – or any sort of enigmatic creature – is not all it’s cracked up to be. “It’s pretty simple, really; unicorns don’t exist,” says digital marketing agency Rogerwilco's Jessica Edgson. 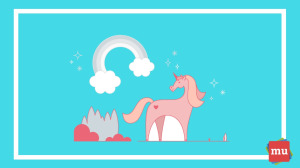 And when she says 'unicorns', she's referring to the marketer who knows how to write exceptional content, code in their sleep and can execute award-winning campaigns faster than making their next cup of coffee. While that sounds like the ideal creative, the reality is very few people can manage that and still do an excellent job. Edgson says that in reality, most successful creatives are “brilliant at one thing, great at a few things and adequate at many things”. It doesn’t matter what area of marketing you’ve chosen to pursue, the fact is that it takes time to specialise. So whether you have spent years learning to write, design, or animate, you’ve paid your dues. What does that mean for your career? Well, marketer – the time you’ve taken to learn how to write, design or animate doesn’t just make you a writer, designer or animator – it makes you an expert in your chosen field. And since you’ve put in the time to hone your skills in one particular discipline, you know exactly what it takes to be the best. You know and understand the industry etiquette. You can be trusted to do your job correctly – meaning less mistakes that could cost you money, or even a client. As a creative, it’s up to you to decide how your career progresses. And if you’re happy with living from deadline to deadline with barely any time to take a breath in between, great – work on. But there will probably come a time when you face deadlines on all fronts and struggle to juggle everything you need to do. A lifestyle that thrives on caffeine, late hours and constant pressure is not practical in the long run. Remember that you need to keep yourself in a space where you feel inspired, motivated and appreciated in order to succeed. You aren’t afraid to upskill yourself when the time comes. But know that there is a difference between staying relevant in your discipline and staying relevant in the industry. Aren’t trends in the industry the same as trends in my field? Well, yes and no. The industry may be leaning towards a new kind of style, technology or theme, but it’s your job to figure out how that influences your particular discipline. For example, perhaps you’re a copywriter with a talent for crafting award-winning radio ad scripts – but lately, you’ve noticed how important video has become to the everyday consumer. It’s time to think about how you can develop your skills and translate them into writing script for video as well. Industry trends and new developments in your discipline are equally important – both will allow you to leverage your potential as a creative. So make sure that you’re always aware of what’s happening in marketing world while constantly pursuing (or crafting – c’mon, you’re a creative) new trends that specifically impact your field. 2019 is here – but what does that mean for all you marketers out there? It’s simple – you’ll need to step up your game if you want to stay relevant. How, you ask? Find out in our article, Four awesome ways marketers can up their game in 2019.